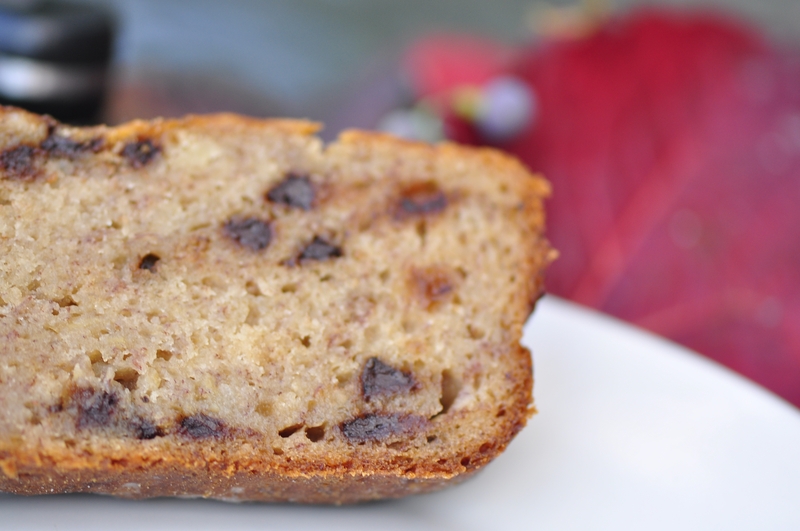 Banana bread is seriously one of the easiest baked treats ever. Whenever you have bananas that are beginning to get too ripe to eat, stick them in the freezer. They’re perfect for recipes like muffins, bread and cookies, plus you’re not wasting food. I just thawed 4 frozen bananas and poured them into the batter; it worked like a charm. Also, using the potato flour and almond meal isn’t necessarily something that you have to do. You could just sub it out for more gluten-free all-purpose flour mix. I just find that those mixes are very hit-and-miss, so I used part mix, and decided to add in some ingredients I thought would help with texture. Beat together butter and sugars with an electric mixer in a large bowl. Add in bananas, buttermilk, salt, vanilla extract and egg whites. Beat until well combined—careful for the batter splattering! In a separate medium-sized bowl, mix together all-purpose flour, potato flour, almond meal and baking soda. Mix the dry ingredients into the wet until a smooth batter as formed and there are no clumps. Fold in chocolate chips. Grease a loaf pan with shortening and pour batter into pan. Place on middle rack and bake for 45-60 minutes—it will be done once a toothpick can be removed clean from the centre. Allow to cool for 20 minutes in the pan, then transfer to a wire rack to complete cooling. Slice up and enjoy! This looks amazing! 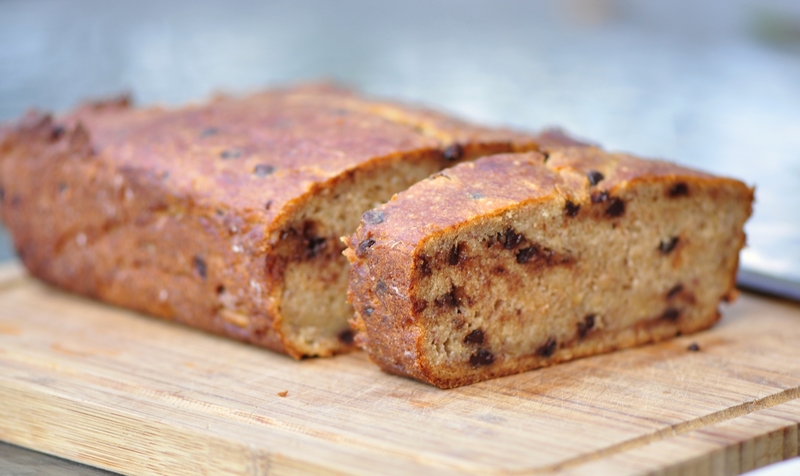 My mom can’t eat gluten and loves banana bread so I will definitely be trying this! Yum, this looks delicious! So moist and dense. Haha… vegans can eat dark chocolate chips (with no milk content, so normally 70% cocoa or higher) so I might use those and surprise my vegan friends when they next come over for dinner. I like the idea of the potato flour. I’ve never used it before but I can imagine how it’d make the bread extra moist and delicious. Thanks V! 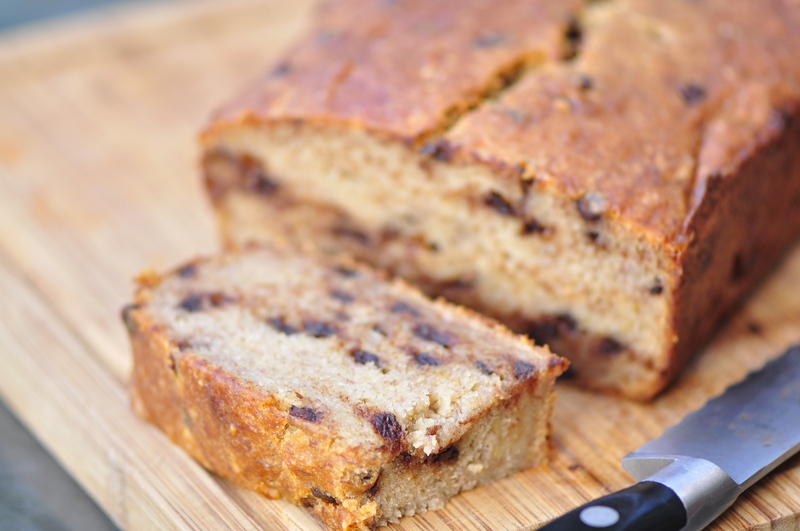 that’s why I love banana bread so much – it’s so frugal and so simple to make. Yours looks fantastic and is even more impressive given that it’s gluten free! I made this for a bunch of friends when one was trying out gluten free and we all devoured it within minutes once I let them dive in. Honestly best banana bread recipe I’ve made or tasted!